So here it is folks. 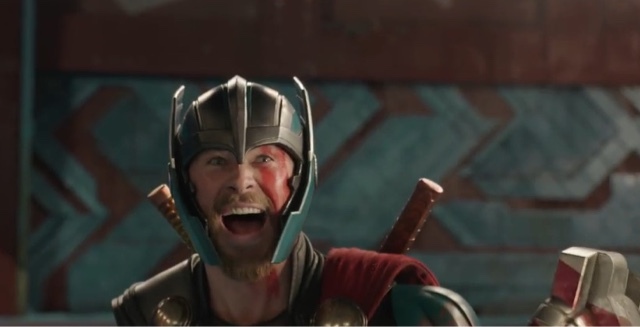 The first official teaser trailer for Marvel's upcoming Thor threequel, Thor: Ragnarok, and boy, what a great teaser it is. This teaser gave us everything we could ask for, one of my favorite things being Cate Blanchett's Hela. She is gorgeous, powerful, and just as badass as they come. I mean, she destroys Mjolnir for crying out loud! But she's not the only character we see here. We get to see Jeff Goldblum' Grandmaster in a couple scene, which I'm pretty excited for, and we also get quick shots of Heimdall and Loki in action. But the (literally) biggest character we see is the one, the only, the INCREDIBLE.......Hulk. And man, does he look savage. Straight out of the 'Planet Hulk' storyline. And this gave us one the funniest parts of the entire trailer... "YES! We know each other! He's a friend from work!" I just about died when he said this. And that brings me to the tone. Is it me, or does this film look like it could be part of the next Guardians of the Galaxy movie? I mean, take out Thor and drop in Star-Lord and it would still work, well, except for him fighting Hulk of course. But the entire look and feel of the trailer, mixed with the choice of music, is very Guardians-esque, not that I'm complaining. I actually love the tone they're going for with this and think it'll work perfectly for the story they're telling. This trailer has exponentially increases my excitement for this film and the entire MCU.